We will build an ASP.NET application that will allow a user to upload iris data file on the server. Server will then read the file and calculate its summary. Summary will include average, minimum, maximum, and Pearson's correlation etc. Using the ASP.NET drawing libraries the application will draw the correlation matrix as a bipartite graph and adjacency matrix form (using some pixel oriented technique). At the end we will compare both the diagrams. In ASP.NET designing GUI is a breeze. First of all open Visual Studio, go to the File menu, select New > Web Site. A dialogue will open. You have to specify file name, location and language. In the template section select ASP.NET website, give any name and path but select C# as language. In ASP .NET file I/O has been made really easy. You just have to include the name space System.IO. You have to create an instance of the StreamReader class. After creating the object you can use sr object to read from a file. A white space is used as a delimiter here, but you can also use any other character as well. Split function splits a string and converts it into an array of character on basis of the delimiter. line = "5.1 3.5 1.4 0.2 1"
In this case rows and columns will be replaced by a constant value at runtime, as specified by user. Variables averages, minArray and maxArray are one dimensional arrays. Each location of array represents one column's result. For example average for column 0 for the data matrix will be stored in averages, similarly colum 3's average will be at averages. There are 5 columns in iris dataset. Fifth column is the class name which is not important and we will ignore it in our calculations. As you might have guessed TableRow represents row of the table and TableCell is the individual cell. LiteralControl is an ASP.NET class. It basically represents elements like string literals that need not to be processed on the server side. They are just displayed without any change. Convert.ToString() is called to for doing double to string conversion. We can save the new binary valued matrix in a text file for retrieving it later on (in some other .aspx file). UTF8Encoding class is for encoding characters in Unicode format. Painting is the most interesting part of this tutorial. ASP.NET comes with extensive set of libraries for drawing on the fly. To draw your image content type of the page should be image/gif. So we will create a new file. Go to File menu select New>File... 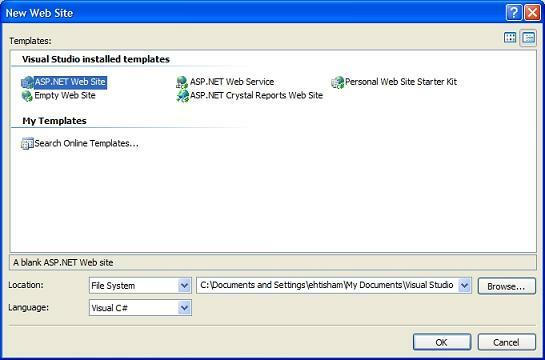 Select the Web Form option in the template section, Visual C# in the language section and give the file any name with aspx extension. After creating the new file place the image control on the newly created .aspx page. 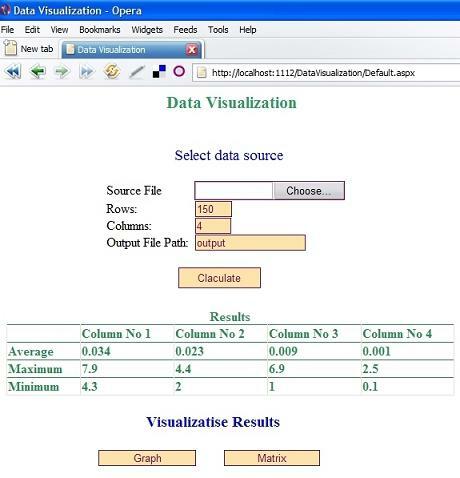 Image control can be found in the Toolbox under the standard category. First of all read the binary matrix from the output text file ("output.txt"). The whole process is like the file reading done previously. Save it in a 2-D integer matrix, as all values are either 1s or 0s. The trick here is to find the output file name in the new form. You have to first place the file name in the session object in the default form. 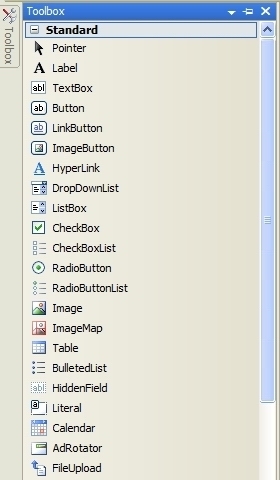 In ASP.NET you have to include System.Drawing namespace to draw something. Although there is a wide array of shapes available, we will only learn three of them in this tutorial (line, rectangle and ellipse). Before drawing shapes you need to create and initialize objects of Bitmap and Graphics classes. x1, y1 represent starting position and x2, y2 represent ending position of the line. Drawing rectangle and ellipse is similar to drawing a line. Only difference is that you need to specify width and height instead of x2 and y2. 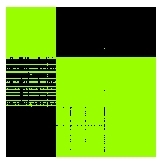 Here is the problem specific version of code for drawing an adjacency matrix in pixel form. Despite of reduction in the number of nodes the graph still contains a large number of edges making it impossible to interpret. The matrix representation contained more information content and was easier to interpret. To make our graph more attractive we have to reduce number of crossings which is a very costly procedure, and it belongs to the NP- Complete category of problems. To solve this we can use greedy algorithms, genetic algorithms or apply simulated annealing. Same file, MatrixView.aspx, handles both requests on the basis of gtype which is placed in the session. Server.Transfer directs the page to the specified file.